Should caravan tow courses be compulsory? Your votes are in! On the blog last month, we asked you to tell us if caravan towing courses should be made compulsory for those who passed their test pre 1997. We wanted to hear your thoughts on whether you think towing newbies should have to complete a course before they hit the road, or if you believed that even the most experienced caravanner would benefit from a refresher course. We were blown away by your response to the poll and now it’s time to reveal the results. 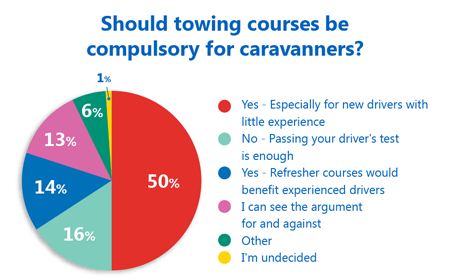 A huge 50% of you voted in favour of towing courses for those new to towing a caravan, while 14% voted in favour of refresher courses for all caravanners – so 64% were strongly in favour of extra towing training. Only 16% of voters strongly believed that passing your driver’s test should be enough. 13% of you appreciate both sides of the argument, and only 1% of voters are undecided, which suggests to us that this is a topic that will continue to divide opinion for the foreseeable future. Click here to read all of the comments in full. Do you agree with the 50% majority? Have your say using the comment box below. As an experienced HGV and recovery driver I feel that towing courses should be compulsory for ALL new drivers. Not just those that decide to tow a Caravan. Referesher courses in any subject are always nice but do not need to be compulsory. And who is going to pay for compulsory courses? It’s just a money making scheme for someone. If something isn’t broken, then there’s no point spending someone else’s money to fix it. I don’t see the point of a ‘refresher course’ – if you are an experienced caravanner then you already know all you need to know. As for compulsion – this is just more expensive regulation when there is no evidence that carvanners represent a significant problem or danger on the roads compared to other road users. I feel a refresher course would be useful for everyone at some stage I have been towing for over 35 years and have noticed vans are now wider heavier longer and even though fitted with extra safety devices on the tow car and trailer. We agree David – refresher courses would benefit caravanners of all ages and experience. While I agree with new drivers should take a course in towing, this would include those towing for the first time. Experienced towers should perhaps take a written test every five years to show that they are up to date with current laws and practices.